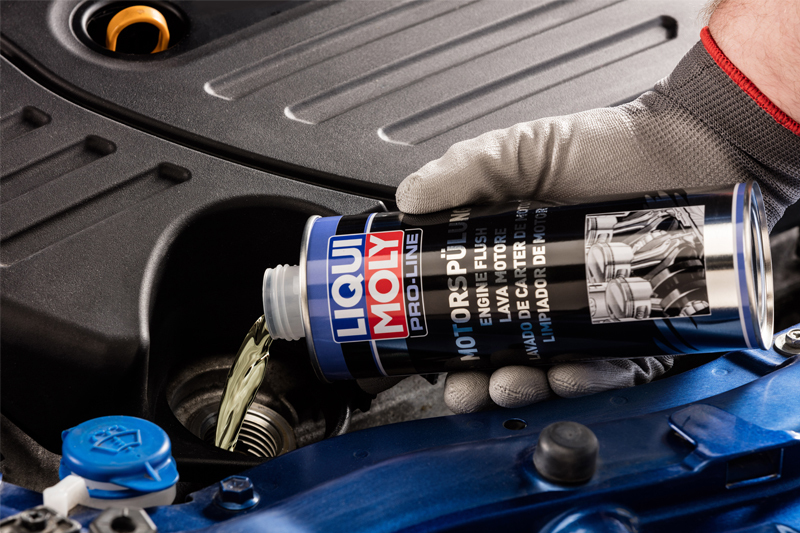 LIQUI MOLY explains how its Pro Line Engine Flush removes oil sludge and deposits. An oil change provides an excellent opportunity to clean the oil circuit, as it enables the fresh oil to perform at its maximum level in a clean engine. Cleaning is quick, without any major additional work, using a product like LIQUI MOLY Pro Line Engine Flush. This additive removes oil sludge and deposits from the oil circuit. Deposits in the oil circuit can result from a variety of factors: ash from small quantities of oil igniting in the cylinder, soot resulting from poor combustion, fuel residues from the combustion process and poor oil quality. Using Engine Flush is easy. Just before changing the oil, add the product to the warm oil and allow the engine to idle for 10 to 15 minutes, depending on the degree of contamination. During this time, the active cleaning agents dissolve deposits and other contamination, keeping them in suspension. The motor oil then needs to be drained, together with the particles suspended in it. The oil circuit is then clean again and the new motor oil can perform to its potential. The alternative with a dirty oil circuit is to do nothing. In this case deposits continue to grow, wear increases and the emission values become worse; the risk of breakdowns and engine damage increases. Considering this alternative, the minor additional cost for Engine Flush saves customers major repair costs later, and this can be effectively communicated to customers.